Originally, when we opened our doors in 2011, we received many phone calls asking where exactly on Route 20 we were located. By telling customers we were on Route 20 between Brocton and Westfield, many people mistakenly pulled into the parking lot for the Lake Erie Regional Grape Program building, which is a few hundred feet down the road from the winery. 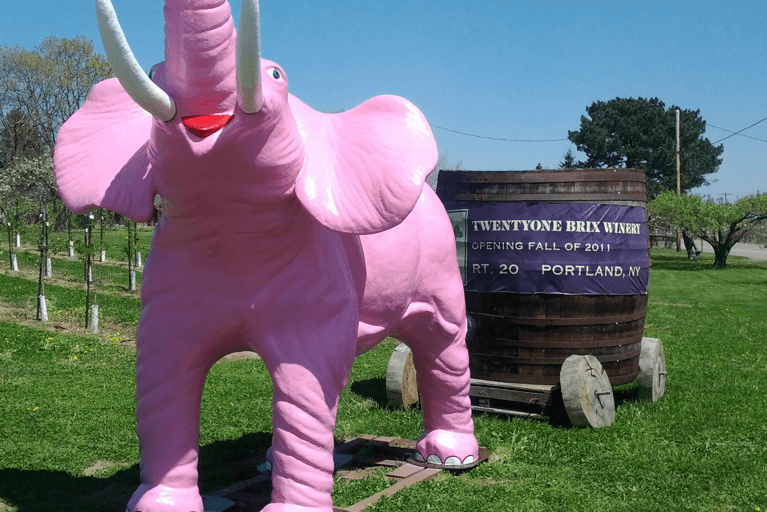 So, until we could have a roadside sign created, we figured a life-size elephant located near the road was the next best thing to draw people’s attention to the winery! We borrowed the elephant from the Farm, which had been using the grey elephant as a denotation for the driveway back to its cherry orchard. 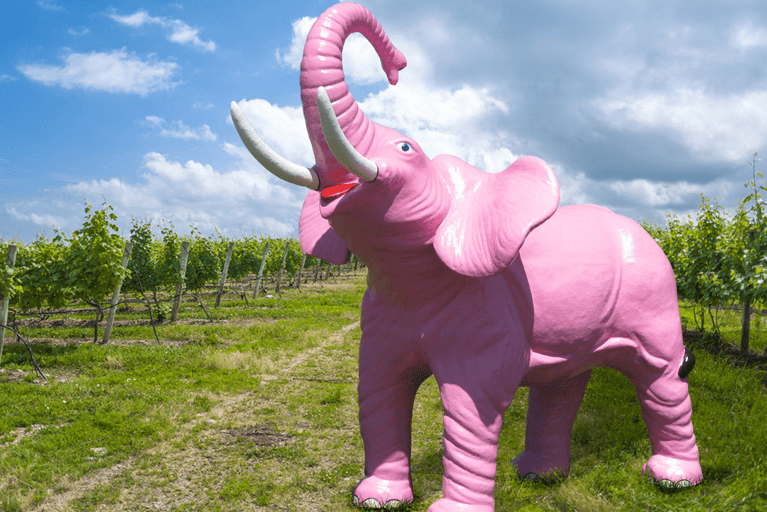 When people called the winery asking about our location, we told them to look for the elephant on the side of Route 20. We’re sure this left people a little confused, but once they saw the grey elephant at the entranceway, they knew they had arrived at the right place! Once people began asking what the elephant’s name was, we knew that we needed to name her. “Ella the Elephant” had a certain charm to it and so, Ella she became. Our original intent was to paint the elephant a different color every few months. However, during the winter of 2011, we soon realized that every color was not flattering on Ella (hence why she stayed yellow – to match the grape harvester – for a very short time)! While planning our Grand Opening Celebration for April 2012, we were looking to release our Pink Catawaba wine but were at a loss of what to name it. After running a contest on Facebook, “Ellatawba” was added to the tasting sheet and Ella went in to the paint shop. She came out all pretty and bright pink just in time for our big party. We changed the names of two house wines (Ella’s White and Ella’s Red) to round out our sweeter series of wines and Ella has been blushing and beaming with pride ever since. It is safe to say that Ella has literally made her mark at the winery and is a great, eye-catching attraction to the winery. Make sure to snap a picture with Ella during your next visit here!